Cleveland Cavaliers shooting guard Dion Waiters sits on the bench during a game against the New York Knicks at Quicken Loans Arena. Cleveland won 109-94. 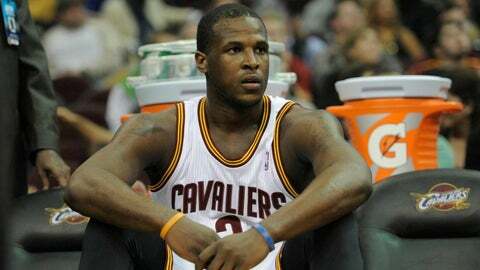 CLEVELAND (AP) — Cavaliers guard Dion Waiters will sit out against Milwaukee with a sore right wrist. The Cavs’ second-leading scorer, Waiters has been bothered by the wrist for several days. He went through a complete warm-up before Friday’s game, but the team announced about an hour before tip-off that Waiters was sidelined with tendinitis in his wrist. Waiters is averaging 14.9 points. He scored 25 points Tuesday night in a loss to Portland. Cavaliers All-Star point guard Kyrie Irving is playing after being sick for the past two days and missing Thursday’s practice. Irving said he’s not feeling 100 percent but that he’s "just got to get through it." Also, rookie forward Anthony Bennett is sick and won’t play. The No. 1 pick in this year’s draft has been a major disappointment, averaging 2.2 points and 10 minutes per game.